Posted 20 August 2016 in Looking For The Awesome. In early June, Kirby received his draft notification. “I was drafted June 7, 1943. I found out the same way as everybody else: They sent a telegram. You get two free telegrams from the Army: One to tell you that you are drafted and one to tell your wife that you are coming home in a casket. Sure, I was drafted, but I didn’t mind going. You didn’t complain about it because it was the thing to do. All my friends were gone, even Joe.” They gave up the Carlton Place apartment, and Roz would move back with her parents for the duration. On June 21, with a final tearful kiss from Roz, Jack turned in his #2 pencil and picked up a gun. According to Kirby; “My card was stamped NAVY. And then some guy came in and said ”We need six guys for the ARMY.” I swear it was stamped NAVY and you know I feel to this day I was meant for the NAVY. This guy came out and being a loser, I was one of the six.” Coincidentally Mort Weisinger, an editor at DC who bedeviled Simon and Kirby while they were at DC, boarded the same embarkation bus. Jack forever swore it was Mort’s way of further tormenting him. Though Jack would constantly explain that he was a famous artist, the Army saw fit to make him an auto mechanic. Now Jack may have been great at drawing huge machines, and constructs, but in reality, he was one of the least mechanically gifted people alive. His friends wouldn’t drive with him for fear of their lives. His kids swear he couldn’t even change a light bulb. It was so bad that even the Army soon realized the error of their ways- and the Army doesn’t admit mistakes easily- and reassigned Kirby as a rifleman. Jack’s attempts at working for Yank Magazine, or other military publications were all rebuffed. Yet one publication did take note of Kirby’s presence. The Savannah Evening Press, a local newspaper in their October 1, 1943 edition had an article that spotlighted Kirby. It was a small article praising Jack for his work on Boy Commandos- it even mentioned Jack’s birth name of Kurtzberg, though it was misspelled Kurtzerg. An expanded article would appear in the Camp Stewart Newspaper a week later. They spelled his name correctly. Army life wasn’t much to Jack’s liking. He wasn’t built for military precision and uniformity. He couldn’t understand why he couldn’t punch out this burly guy constantly yelling in his face. ”You’d get ten years for punching a sergeant so I couldn’t punch a sergeant.” And he couldn’t draw. How could he survive without a pencil in his hand and paper in front of him? “I hated it there and they always gave me a hard time. I am not a guy who likes to be disciplined. I hate discipline of any kind except the kind of discipline I make for myself, like when I draw. If it is not right I’ll redraw it 19 times until I get it right, but Army discipline I wasn’t ready for. “Stand straight. Get up. Lay down. Do this. Do that.” They would wake us up at two o’clock in the morning and make us hike 50 miles, 25 miles up and 25 miles back. That is a long walk with a full pack, a rifle and everything else—that’s a long walk without them. And at two o’clock in the morning, are you sleeping or walking? And you are doing this all on roads as rough as hell. “The thing is that we all met. I met people from Georgia. I found people of my own religion living in Georgia. There are a lot of Jewish people living in Savannah and there were a lot of Jewish people living in other parts of Georgia, in all parts of the South—even in Texas. I realized that there were a lot of similar people living all over the place. I began to get a feel for the United States in a way I never had before. I could envision the United States as the American flag. The stars and the stripes–the meaning of it. Jack explained to Ray Wyman Jr, in an interview. Anita was sort of high spirited, and Jack set up another date for her, this time with his sergeant, Morris Katz. It was hate at first sight; they fought for the whole date; pure oil and water. Three years later, Morris Katz would show up at the Goldstein residence looking for Anita, and they married soon after. 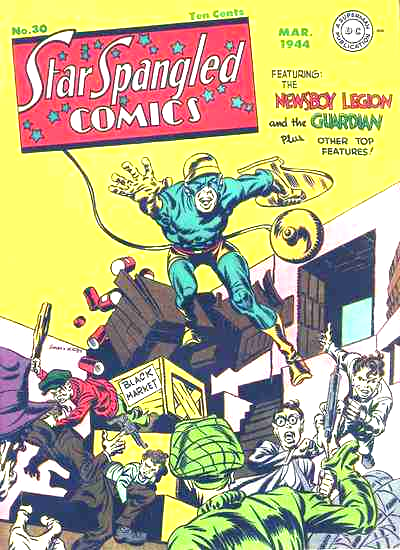 While Kirby was doing his service, Republic Pictures released a Captain America serial. Nowhere to be found were the names Joe Simon or Jack Kirby. It seems that Martin Goodman had given the rights to Cap to Republic free of charge, expecting the free publicity to make it worthwhile. 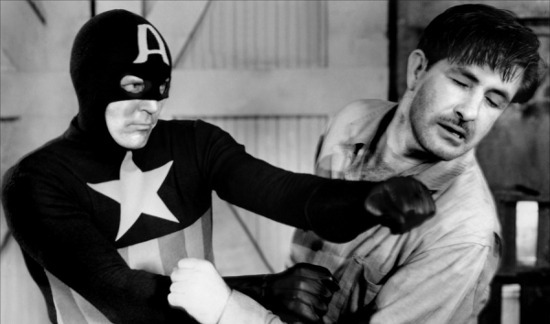 The 1944 “Captain America” film serial is a bit of an oddity. Unlike the new Chris Evans feature, or any other incarnation of the hero for that matter, it totally abandons the basics of the comic book character. In place of US Army Private Steve Rogers the striped suit is filled by District Attorney Grant Gardner. There’s no Super-Soldier Serum, no massive patriotic shield, no temple wings, and there aren’t even any Nazis. It’s an odd cross between the superhero genre and the noir/crime serials that Republic Studios put out around the same time. Simultaneously entertaining and a little confusing, it poses an odd question about what a superhero film should look like. The choreographed action and brashly structured suspense lend a momentous energy to this entertaining serial. It’s not just that they spent a ton of money, which they did. After going 22% over budget, “Captain America” ended up costing Republic around $220,000 and is the most expensive serial they ever made. Yet instead of just tossing around effects left and right, every moment of explosion and destruction is used perfectly. Guillotines, exploding cars, and massive bulldozers come and go across the screen, raising the bar for each successive moment of suspended climax. It’s been claimed that the large budget convinced Republic to get out of the serial business. By June ‘44, the camp originally built to house 40,000 swelled to over 55,000 soldiers awaiting the build-up for D-Day. 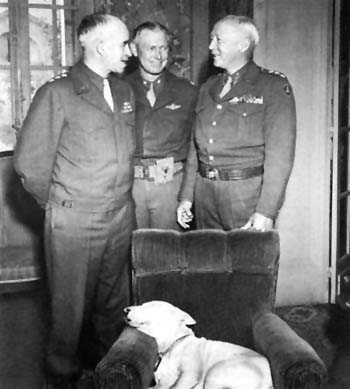 Jack, now assigned to Company F, 11th Infantry under the overall command of Gen. Patton left for Europe in the middle of Aug. “I think we reached England at nightfall. We landed in Liverpool. England was in a terrible state. They were still suffering from the Blitz. The German Stukas and bombers had dropped bombs everywhere. The people were still sleeping in the subways—the Germans had made a mess of Liverpool—but we didn’t stay there long; they immediately took us out of Liverpool and we reached Gloucester. I remember a lot of walking and a lot of waiting. We were tramping through the streets there and were on our way to another POE. I got a glimpse of the English countryside when we reached the embarkation area near Dartmouth and it was like a garden; it was the most beautiful thing that I have ever seen. We were there for about 2 days, then we left for France and landed on Omaha Beach”. He stepped foot on the still body strewn shores at Omaha Beach, on Aug. 23rd. From there he quickly met up with the rest of the 11th Infantry as they marched through Eastern France. With control of Northern France, and reinforcements now firmly in place, Eisenhower made the controversial decision to split up the Allied forces and make a pincher move on the heavily guarded German military industrial centers in the Ruhr, and from there on to Bastogne, and then to Berlin. Many of his Generals had counseled him to keep the Army together and make a direct assault with overwhelming forces and crush the enemy in one fell swoop. Yet Eisenhower was wary, he still feared the German’s could regroup and mount a rear offensive looping around from the South. By splitting his forces, he protected his southern flank, and with two fronts forced the Germans to spread out their remaining forces. Eisenhower decided he would send the largest segment of the army on the more direct northeastern route through Antwerp, above the Ardennes, and a smaller army on the more circuitous route south and then east through Metz and Saar. This smaller army was Patton’s Third Army Corp, a faster, more mobile force known for covering territory very quickly. This was to be called the Lorraine Campaign. Spearheaded by the famed 761st battalion– the all-black tank regiment that would lead the fight from France through Belgium, and into Germany– Patton’s Panther’s better known by their battalion name The Black Panthers with their bold motto “Come Out Fighting”. This elite tank group would engage in a record 183 continuous days of combat, clearing out numerous German held cities, freeing concentration camps, and inflicting over a 130,000 casualties to the Germans. Their fighting spirit and never say die attitude emboldened the fighting men and the honor of meeting up with the Russian allies fell to the 761st after breaking through the Seigfried Line. A sad note that one of their leaders could not join up with the battalion; their moral leader Jackie Robinson, the college football great was fighting a court-martial due to his refusal of giving up his seat on a public bus. Jackie was cleared of all charges and left the service with full honors, He would be heard from later. “I was a replacement–a replacement for people who had already been wounded or killed. I went into action right away, my outfit was on assault. We were heading towards Metz, and the objective of my outfit was to take Metz.” Kirby reminisced. Almost immediately there were problems. The Armies were advancing so rapidly that they outran their supply system. The Generals fought and fumed over who would get the gasoline; Field Marshal Montgomery won out. Gasoline supplies were dangerously low, and re-supply ground to a halt. General Patton, though warned of the situation ordered his officers to continue on, but by Aug. 28 they came to a stop, just west of the Meuse River. Though his main force couldn’t move, Patton ordered small expeditionary forces to cross the Meuse bridges and try to feel out the enemy strength. By Sept.1 they had made several beach heads across the Meuse, and on to the west bank of the Moselle River, just outside of Metz, but that was as far as they got, on Sept. 2 the Third Army was at a stand still, there was no gasoline to take the tanks and trucks across the Moselle bridges. The German generals were told to hold position at any cost. The resulting lull allowed the Germans to do what Eisenhower most feared; it gave them time to regroup, dig in and bring in reserves. From then on, the march towards Metz would be a bloody fight, over farms and embankments, small towns and well built fortifications, criss-crossed with rivers and canals. Victory would be measured in yards, not miles. It would be one of the bloodiest episodes on the road to Berlin. To make matters worse, the rainy season for the Lorraine Valley begins in September, and in 1944, there would be three times the average amount of rain. The clay terrain would turn to a viscous texture that swallowed up tanks, trucks and marching feet. The armies were now at a stalemate staring across the Moselle River; every attempt by the Allied forces to cross it was met with a fierce counter-attack that drove it back. The rains made land travel difficult, and the rising river made boat travel treacherous. 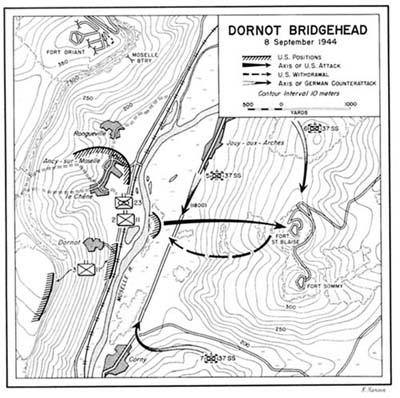 On Sept. 8, a small Allied force attempted to cross the Moselle at a small hook in the river called Dornot. Their target was a fortification named Fort St. Blaise, one of several Maginot Line forts retrofitted by the Germans after taking control of France. It was a well built medieval fortification on top of a bluff overlooking the river. Among this force was Kirby’s Company F of the 11th Infantry. The rain was horrible, but under cover of blistering artillery fire Companies F and G worked their way across river. They gathered at a small patch of trees on the east side and formed a horseshoe shaped line of trenches. 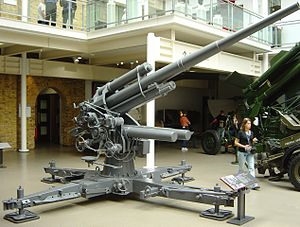 German resistance was light, but whenever there was a lull in the Allied artillery fire, the Germans would lob mortar shells with deadly accuracy. In late afternoon, the two companies broke from the trees and made a frontal assault up the hill towards the fortress. During this assault, two more companies made their way across the river and occupied the horseshoe trenches. The Allied troops on the west side of the Moselle were helpless to send reinforcements. The area was too small for larger vehicles to maneuver, and they were being shelled by large German 88’s that made boat crossings impossible. For two more days the four Companies were left to fend for themselves. It was decided that the Allied forces would move further down river and hope to make a safer crossing while the Germans were occupied with the four companies at the tree line. The report of the loss of all men resounded across the battlefield with no correction ever made. Jack Kirby had his baptism by fire, and in the fog of war, thought dead. The remnants of the four companies made their way back across the Moselle River and rejoined the main line. Their casualties were so high that they combined together and became one new company. The intelligence was mass confusion. Kirby learned the lesson of the “fog of war”. He said; “Suddenly, there was my colonel and with my colonel was General Patton, and Patton looked at us and looked at a map. He says, “You guys are supposed to be dead, Why aren’t you dead? He was dismayed. Something on his map was wrong, because we were supposed to be dead. The Germans were supposed to have overrun us, and they had. We just didn’t like the idea.” “But like I said, I couldn’t hear most of what he was saying, except when he raised his voice and all the other officers stepped back like he was going to slap them. Of course, that wouldn’t happen in an American army, not in public at least where all the GIs could see. So, this went on for—I don’t remember, I was too frozen to care, but it went on for quite a while. I heard that Patton ordered replacements. He thought my outfit had been wiped out. So some foul-up I guess, signals crossed, messages mixed up; it happened quite a lot during the war. Driant was a failure for several reasons; The weather didn’t permit aerial coverage. The men were not trained for this type of direct assault on a fixed position; they did not have the proper equipment and Patton’s intelligence let him down. He was told the fort was manned by a small poorly trained and tired staff while in reality, the defense had been taken up by a group of well trained, arrogant, and resourceful units from a nearby officer candidate school full of fanatical Nazis. They were bright, shiny, and well entrenched at the strongest of the Metz’ forts; they weren’t trained to lose. After the battle, the combined count of E and F was less than a hundred men. When asked by high command, the Captain told them; ”The situation is critical. A couple more barrages and another counterattack and we are sunk. We have no men, our equipment is shot and we just can’t go on. The troops in G are done, they are just here, what is left of them…The enemy artillery, especially the 88’s are butchering these troops until we have nothing left to hold with. We cannot get out our wounded…” The soldiers didn’t care if it was a win or loss; they just wanted the hell out of that meat grinder. It was a small bit of land that they could easily go around. The enemy wasn’t going anywhere; they were surrounded and cut off from supplies. Let the Jerries camped in that big mound of dirt sit and play with themselves, they had other targets to hit. In early 1944, Russia had come across the first provable concentration camp. That was Majdanek. Though empty and the prisoners reassigned, the carnage visible was catastrophic. 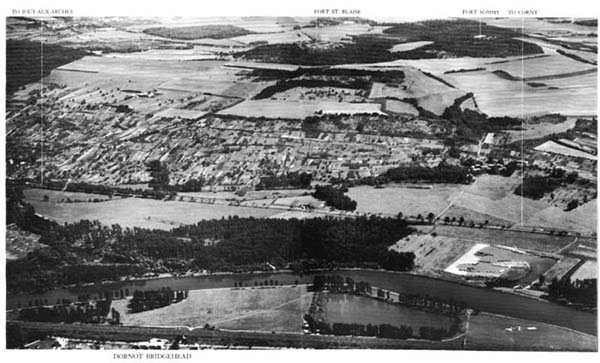 As Patton’s army crossed Western France, it became obvious that the Nazi’s had peppered France with a large system of concentration, and work camps, Some were large, like Fort de Queuleu, while the area around Metz and Nancy contained many smaller individual camps as well as sub camps of larger compounds like Orhdruf. The soldiers often came upon these out of the blue with the last of the guards running away and looking for shelter. Most of the prisoners—at least the healthier ones had been reassigned to Germany or Poland with the advancement of the US Army. Yet some were found full and horrible, containing some of the worst of the human hunger dogs commanded by the Nazis. Captain Alois Liethen, an intelligence officer was one of the first American soldiers to see the camp, wrote the following to his family in a letter dated April 13, 1945: He toured with Gen. Eisehower noting the atrocities as they were found. Eisenhower promised full reporting so that no one could ever deny or sugar-coat what was found. With them traveled a group sarcastically called “The Ritchie Boys” a group of Jewish refugees who became translators and interrogators of the found Nazis. The quarters which they had were about as bad as I have ever seen. In a building about 100 x 30 there were from 200 to 250 men and their bunks were less than two by two by six — just like pigeon holes along the whole wall. I didn’t even go into these buildings because of the fact that there were definite signs of infestations of typhus bearing lice as well as many other communicable diseases. Bathing facilities were just non-existent, but that is not the worst of it — when a man was killed or died of beatings he was simply stripped of his clothes and these were reissued immediately to some other living cadaver. Shoes were out of the question and all of the footwear was a wooden sandal — not even so much as a whole wooden shoe. As long as I am writing a horror tale I might as well describe some of the people who were in charge of this camp. The commandant (a man whose name I knew back in the states and who I am looking for now more than ever was an SS Hauptsturmführer BRAULING, and his right hand man was another SS man by the name of STIBITZ. Their favorite pasttime together with one or two other camp officials was to go out to the burning pit with a bottle of whisky each where they would sit and watch the burning of the weeks accumulation of dead bodies while they joked and drank their whiskey. Personally, the stench of the pit was enough to drive me nuts and a bottle of whiskey might have been a good thing for me while I was there. I have smelled a lot of foul odors — like out at the rendering works and other places — but this one was the worst. Evidently they were in such a hurry that they didn’t get enough tar and wood on the last pyre for there were about fifty half burned cadavers lying there in chars. As I have stated this is not the first one I have seen — I saw another which was a more or less refined version of a concentration camp — this one was in the vicinity of Metz. Here, that is in the one near Metz, were kept the pure political prisoners and they had better conditions and the crematory was a fancy thing, not unlike a bake oven which they showed in a series of pictures in LIFE some time ago. At this one I was mildly surprised and I don’t think that I even mentioned having seen it — this latter one tho is really getting into the real thing. And, when one considers that this place was just a branch unit of a bigger one, well, then you can well imagine what the larger ones are like. The vision of these horror pits was nothing ever to joke about. The effect was chilling. Jack Kirby would occasionally mention just such a camp, yet for this anecdote alone he never laughed or embellished to make it more palatable. He told it straight and sadly. He never placed a specific name to this tale. “Yeah, I’m Jewish.” Jack queried back, unsure of who was asking. Not sure who he was following Jack moved forward slowly. They approached a small enclosed wooden tower. “There….there” the man pointed anxiously with shaky fingers. Jack stared at the encampment. He saw German guards fleeing at top speed, yet not too fast to forget to scream epithets at the G.I. After the Germans had cleared the area, Jack and his men approached. He opened the stockade hoping to find a few recent prisoners. What he saw astonished him. Hundreds of old, starving, pitiful prisoners came forward hoping to get relief. These were the sicker, more elderly workers not up to being reassigned to other camps, so they were left to fend for themselves. These were the absolute dregs, starving, tattered, and sickly. Jack just stared at this horror, his mind numbed by the sight, he just muttered. “Oh God! Oh God! Over and over. 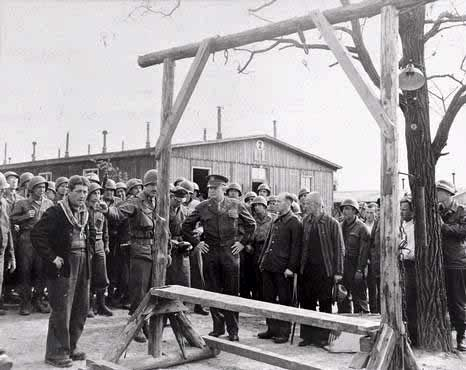 The camp near Metz, which Captain Liethen referred to in his letter, was Natzweiler–Struthof in Alsace, which was discovered by American soldiers in September 1944 after it had been abandoned. This was a small sub-camp of the infamous Struthof Gulag. Metz, with its heavy medieval fortifications, its central railroad and many factories had many such camps to put the people to work. As the Allies neared prisoners were sent across the border to even worse camps in Germany and Poland. At the Fort de Queuleu camp just west of Metz, they uncovered a mass grave with over 20,000 corpses—perhaps the worst case in France. Jack would occasionally draw a concentration camp in his war books, yet he would never gloss them over or spoof them up for laughs. The anxiety and tedium was broken only by the infrequent letters from back home. Jack told biographer Ray Wyman: “I would go into these towns that nobody had yet, and there would be German patrols there, and I would head the patrol and we would scout around this God-forsaken town, and we would mix it up with the Germans. And there would be hell to pay. And then we would get back to our lines, and they are passing out the mail. I was dazed you know, by this time. It was a kind of post-anger; I hadn’t finished with the situation yet and was still in the throes of the most vicious intentions when I came back to this mail. They were insane but beautiful love letters. They were so beautiful that I couldn’t believe it.” But mostly there was endless marching, followed by standing watch in knee deep mud or sleeping on the cold wet ground. The weather had turned cold, and the rain continued. The only change was the occasional reprieve when the forces were rotated and rested for a day or two. Jack recalled: We were stuck in one of those spots where the enemy was just plastering us. They were ripping up the earth with heavy machine gun fire, tearing us up with 88’s. They opened up some kind of an offensive, or they were just plain sore at us. It was the end of the world. Guys were flying through the air, guys hitting the ground. They were ripping everything in sight- trees, bushes, the entire shoreline. We didn’t know what to do, so we lay there, and a guy crawls up to me from out of the rear, and says, “Take five guys and crawl back about two hundred yards and there is a truck waiting- and go see Marlene Dietrich!” I’m looking at this guy like he’s a nut. I figured the war had got him and I should say something nice to him, but I was sore because I was scared. Everything was going up–the whole shoreline was now a ragged chewed up bit of earth. I mean, it was chewed up and more was coming in. This guy says, “Do what I tell you, take five men” I did what I was told, so I picked five men who were just as amazed as I was. I said,” We’re going to see Marlene Dietrich- and these guys thought I was nuts! But this was our big opportunity, they would go nuts too. So they followed me, and we went back, and there was this truck. Wellington boots or rubber field boots had been created late in World War 1 to help fight frostbite common in the trenches of that war. When WW2 started the factory was revived in order to produce boots for the British military. 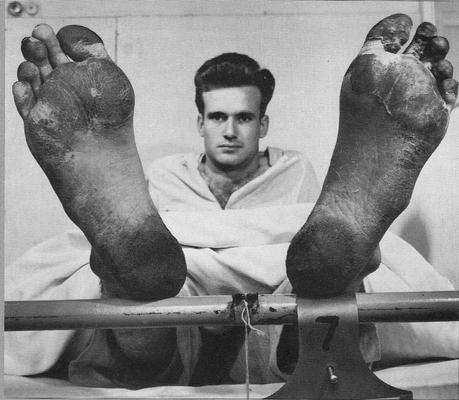 With the additional feet of the Americans, the factory could not keep up with demand. The weather was taking its tool. The major offensive began on Nov. 8, rain continued unceasingly. The walking troops were ordered to remove their rubber overshoes, as they made maneuvering difficult. On the night of the 10th, a cold front hit, and a light snow began to fall. Roz was frantic. The frequent V-mails from Jack had stopped. Then one day she got a telephone call from England. She was informed that Jack was in a hospital. When informed that his injuries were to his feet, she sobbed with relief and thought; “Thank God he’s OK!” Then self mockingly; “Thank God it’s his feet, not his hands.” Soon the letters began coming on a regular basis. In a letter dated Nov, 22, 1944, Jack jokingly told Roz of his arrival in England. “Surprise! Am in merrie ole H’england again with my gazoola still resting ‘neath comfortable sheets and my brogans [feet] stuck daringly out in the ozone to defrost in gradual stages. Nice enough place – chow is good and attendance pleasantly given. Have certainly made the rounds since I last wrote you and am still uncertain as to the extent of this amazing situation… However, with the exception of a dull numbness in the tootsies and a rheumy drawing in the joints am still intact and functioning. Love you more’n ever. Hope you’re not worrying, Please don’t, honey. Jackson. In another, dated Nov.25, 1944, Jack remarked about the lovely women who surrounded him at the hospital. “Dear Long Limbed and Lovely, “My brogans may be frozen, but my glands are steaming to a rapid high in Fahrenheit. Have reams of gorgeous Petty and Varga girls plus numerous other streamlined sirens preening themselves enticingly in the mags about me. Being a very virile type of individual, I’m afraid this contact with these captivating hussies is gonna be one to beware of biologically”. It was signed affectionately with his nickname, Jackson. It appears that that “virile” individual succumbed to that temptation and, true to his stated fears it was a blow to his biology. Like so many other soldiers, Jack had to take a series of four penicillin shots for being so social. Jack was a man, not a saint. In March, Roz traveled down to North Carolina for a much needed visit. She found her once burly husband slimmed down to a meager 130 lbs. “He was so thin!” she would proclaim. It seemed that seeing Roz again did wonders for him. Jack had been put on restriction for some rinky dink reason and couldn’t get a weekend pass. So Jack came up with a clever ruse. He flashed his medical card (which was the same color as a pass) to an uncaring guard and as Jack would explain. “I took it out like this, see? I held it so the guard couldn’t see the front. And there are all these guys, they’re going out to see their wives and girlfriends, too. It was a parade! So the guards, they weren’t taking the time to look at everything so carefully. I just walked out with the rest of them.” He met up with Roz at her hotel room and as Jack would say: “We didn’t even close the door.” Author’s note: Susan was born nine months later! On Kirby’s military records, it would show Kirby with an AWOL violation, but since it was so close to his release, nothing ever came of it. “What were they going to do?” Jack would ask incredulously. The war in Europe was finally over, and on July 20, 1945 Kirby was honorably discharged and sent home. Given a combat infantry badge, a European ribbon and a bronze star, he returned home a conquering hero. For the rest of his life Kirby would revel in relating his war exploits. Real or exaggerated it made no difference; the war had left an impact on Kirby’s psyche that would never leave. He had witnessed the butchery that men can do, and seen the bravery and shared the camaraderie with men of all faiths, and backgrounds. His stories were always representative of the humanity he found amongst the horror. “There is nothing that you would call “romantic” about war. “Sure, in the movies and on television they paint a great picture of the fellowship that it creates. I’ve seen war bring lots of people together, but I can tell you that the cost is extremely high: Not just in terms of lives, but in the human spirit.” “I think that we are diminished by war; our character as a race is somehow reduced by each war that we allow to happen.” He further stated; “Well, I can’t remember what happened yesterday; I could not tell you what I ate for breakfast this morning, but I recall the faces of everybody that was in my unit. I recall their names, I recall where they came from, I recall the manner of their speech and even the common everyday things they did; unimportant things that make the whole event real. That is how the mind works: It retains the significant events of our lives by memorializing the important moments. It happens when we are faced with events that are pleasurable and those that are unpleasant, especially when we are faced with danger—at times when our lives are hanging by a thread. It was like that nearly every day of the war. The threat was never far from our thoughts, I can tell you.” Jack did his duty, but the nightmares lasted a lifetime. Posted 7 August 2016 in Looking For The Awesome. There’s no record exactly when Jack left the Boys Brotherhood Republic. From published illustrations we know that he was involved in 1937, and stayed in contact into 1938, when he attended a testimonial dinner in Harry Slonaker’s honor. Yet the experiences and the teachings of the BBR never left him. It is no surprise that when Jack Kirby finally had the freedom to create his own books that he would use the slums, the BBR and Harry Slonaker as his inspiration. With the formation of the legal partnership with Joe Simon, Jack was no longer an artist assigned by the editor to a strip; he was now a full participant in the creative process. With the creation of The Newsboy Legion, Jack had found a place to tell his stories. This was Jack’s book, it didn’t matter if it said Simon and Kirby on the splash page, and there was no doubting who the captain of this series was. This was Kirby’s chance to pay homage to the man and group that had guided him to manhood, and responsibility. This was Jack’s way of paying the debt forward, and continuing the legacy of Harry Slonaker. While Harry Slonaker didn’t really save the founding members from a cruel stay in JD, the success of the BBR would lead some judges to turn over young charges into its care. The records show that in one instance a boy was even turned over to the BBR in lieu of going to the penitentiary. In one early story, the evil of back store gambling was the starting point for a spirited tale of mob control over gambling, and the Newsboys and the Guardian’s determination to break it. In 1934, the BBR Reporter ran a report of an investigation by a BBR committee on gambling-especially the penny slots found in the back rooms of candy stores. The head of the investigation was Kirby’s best friend Georgie Comet. When the BBR’s new City Hall was dedicated on Jan. 19, 1934 Mayor Fiorella LaGuardia officiated. George Comet gave an update of their investigation to the Mayor and Judge Samuel Seabury. Comet ended by promising the Mayor “My men and I are hoping to get the goods on these penny game rooms soon.” A NY Times reporter wrote of the broad smile that crossed Judge Seabury’s face when Georgie made this promise. Taking the cue from other BBR experiences, Kirby’s Newsies would start up their own newspaper, very similar to the BBR’s Reporter, and there was Scrapper/Kirby as staff photographer. In another tale, they even get to run the city for a day, just as members of the BBR did when invited by New York Gov. Lehman to Albany. 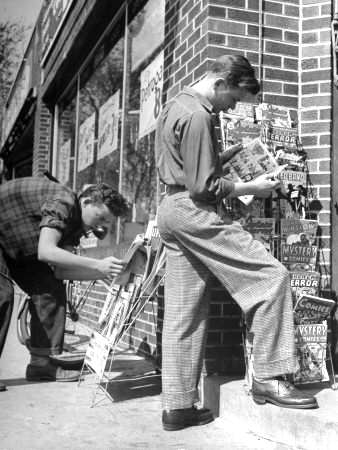 There were the brushes with the uptown swells, and it was common for celebrities and sports figures to stop by and kibitz with the BBR kids, and in one Newsboy Legion story the Newsies were feted by a galaxy of Hollywood’s finest. Every issue would have plot elements and characters ripped from Kirby’s child hood memories and his time at the BBR. The villains were big time mobsters, slum lords, street gangs, and crooked politicians; the human rats of Jacob Kurtzberg’s past, as well as a new threat that had wormed its way into the American fabric, Nazi bundists and fifth columnists. And when things got tough, the mysterious Guardian was always there to help bail the Newsboys out. The stories are fun action filled super-hero fantasy tales, but rooted in the real life experiences of Jacob Kurtzberg and his life in NY’s Lower East Side, and his time with the BBR. In 1940, Harry Slonaker took his beloved wife Besse back to Chicago. In 1942, while waiting to be drafted, the Slonaker’s moved to California so that Besse could stay with her brothers. While out West, the Overage Exemption law was passed, and the 38 year old Slonaker learned he would not be drafted, but Harry had fallen in love with the San Jose area, so he and Besse chose to remain in California. Harry was restless, the time away from his kids gnawed at him, so in 1944, while working for a wholesale cosmetics firm, Harry spotted a group of youngsters playing in the rock strewn, litter filled area of San Jose, known as Backestro Park. He noticed the lack of supervision and poor quality of the facilities. His response was to recruit a new group of boys and form the Boys City Boy’s Club. Just as in New York, the group patterned themselves on republican styled government, elected their own officials, and policed themselves. From 1944, till 1971, the man known to thousands of boys as Uncle Harry directed the Boys City Boys Club of Santa Clara County. From a rent free vacant neighborhood grocery, the BCBC moving pillar to post would eventually outgrow 8 temporary homes, until in 1951, Harry cajoled, pleaded, and otherwise convinced a consortium of architects, building supply companies, labor unions, public officials, and other concerned citizens, to pitch in and build a permanent site on land leased from the city of San Jose for one dollar a year. Jack stayed in touch with his Guardian, and when asked Jack provided some cartoons for a San Jose newspaper article on the Boys City Boys Club. In 1947, the New York chapter of the BBR established the Harry Slonaker Association in honor of this man. In 1964, Santa Clara County in California named a new Elementary School after him. Despite such accolades, Uncle Harry remained a humble and gracious gentleman. In announcing his retirement he likened himself not to the Captain of the ship, but more as a “kind of navigator and harbor pilot serving with many a Captain and crew’ whose role was to offer guidance to help the ship maintain “its proper, direct, and even course”. In 1969, Jack Kirby would move to California, and finally settle in the Thousand Oaks area, several hours south from San Jose. In 1970, now with DC, and given the freedom to again produce his own stories, Jack Kirby would revive the Newsboy Legion and a new generation would thrill at their exploits, and the Guardian was still there to watch over them. In his magnum opus, the Fourth Word tetrology, Kirby introduced a new character, one who would be a bridge between the young Scott Free’s savage life on the slum-world Apokolypse, and his dream of a world of self-fulfillment and civility. Himon was to become one of Kirby’s more symbolic, intriguing, and iconic characters. Never was an obituary more wrong. Harry Slonaker had thousands of children, and they would grow to be writers, professional athletes, policemen, actors, and even Presidential advisors. One would die heroically, spitting in the face of terrorism, and one would become the greatest storyteller of his generation.